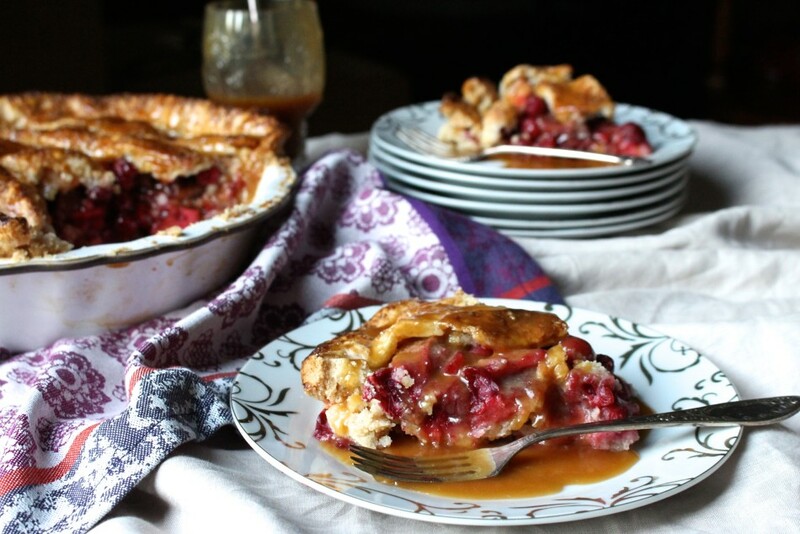 Hey there, I’m back with another pie brimming with cranberries and pears! Cranberries are burst of color in the late fall and could not come at a better time of year. It’s one of my favorite ingredients this time of year. Just when produce is beginning to pale in color, lo and behold, the festive cranberry for cakes, cookies, muffins, jams, dressings, and of course, the iconic sauce on Thanksgiving…and pie…SO good in pie. You probably have your Thanksgiving menu honed in and are ready to go but before you do your final check we need to talk about this pie. Cranberries have such a chameleon-like way about them; turning its’ (very) tart self into sweet little gems with some sugar and spice. Then add pears, specifically Seckel, a firmer, less sweet pear for texture and good for baking and Bosc, a more sweet variety that also holds up well when baked for a blend of sweet and tart in every bite. 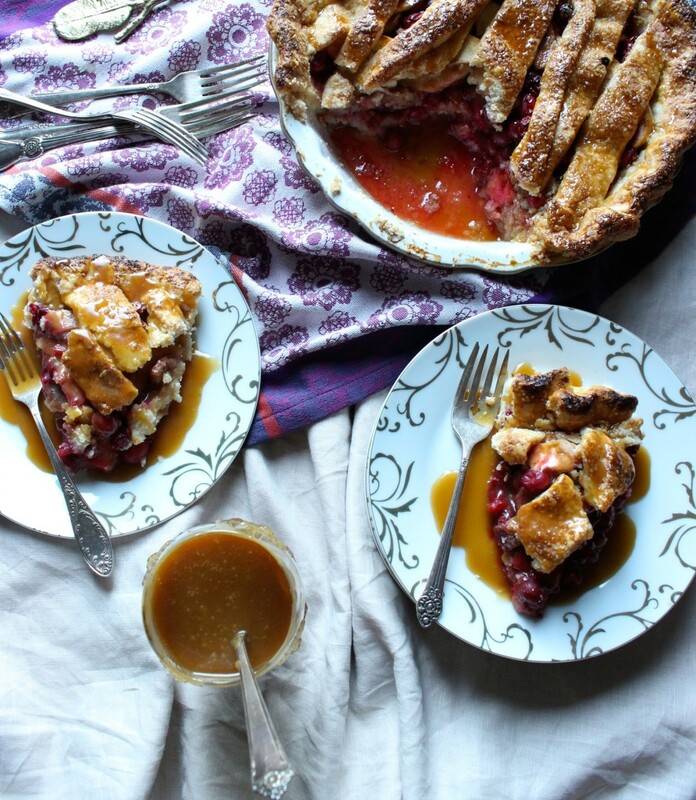 I was inspired by salted caramel apple pie from The Four & Twenty Blackbirds Pie Books; it will have you smitten. They also have a pie shop in Brooklyn but nothing gluten free or gluten, dairy free (sad face). Let’s wait 2 hours to let it cool and redistribute fruit juices before slicing. Don’t use just love the vibrant color? 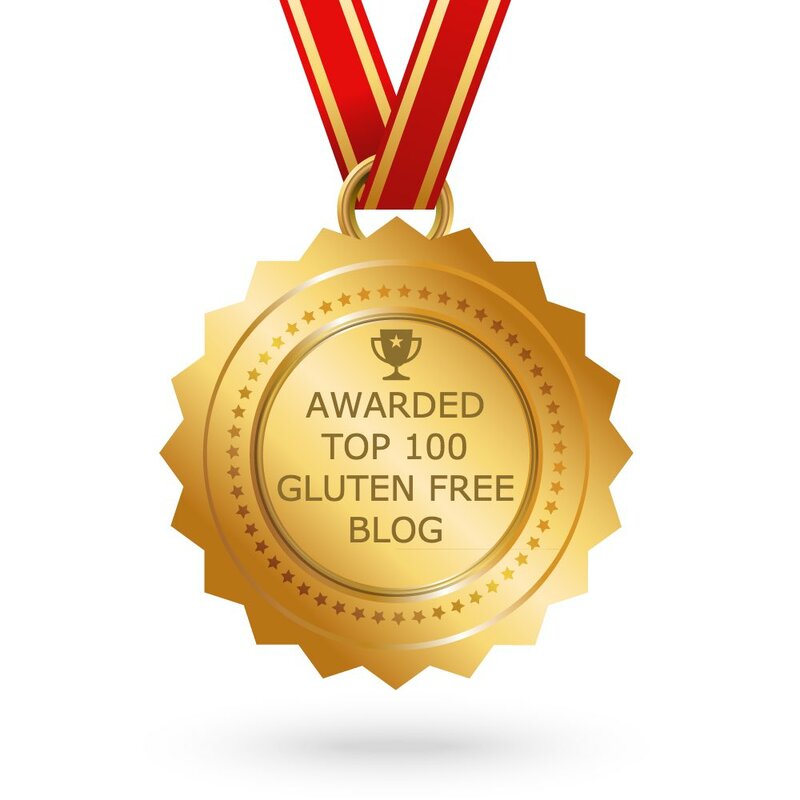 When entertaining allergies, your guests will never feel like you made this “allergy free” and what I mean by that is, you know when you are invited to a party and they ask you to specify allergies on your RSVP card? And then come to the party and served a plate covered in plastic wrap that looks like it came from the back of an airplane? You know what I’m talking about…that “it’s allergy free made just for you” can feel isolating. 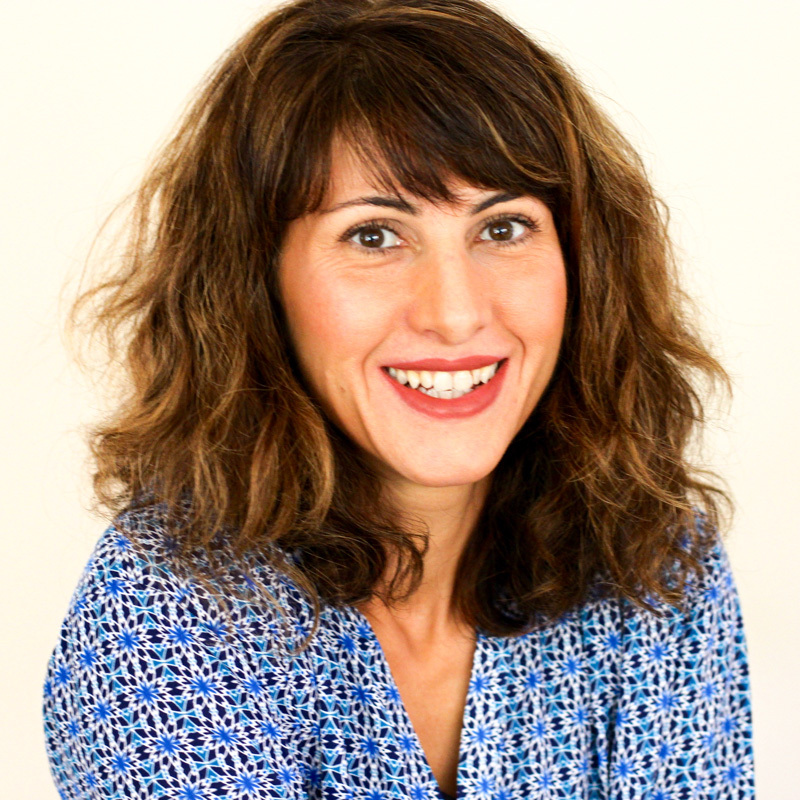 I know the feeling all too well and make sure that my guests never feel that way, so it has to be good enough for EVERYONE. Yes, it’s gluten, dairy, soy, (and nut if using rice milk) and egg free but forget that it’s an “allergy free pie” rather more a pie that your gluten, dairy, cheeseburger eaters will love and may become one of your family favorites too. Inspired by apple pie with salted caramel recipe from The Four & Twenty Blackbirds Pie Book that is a family favorite of ours. 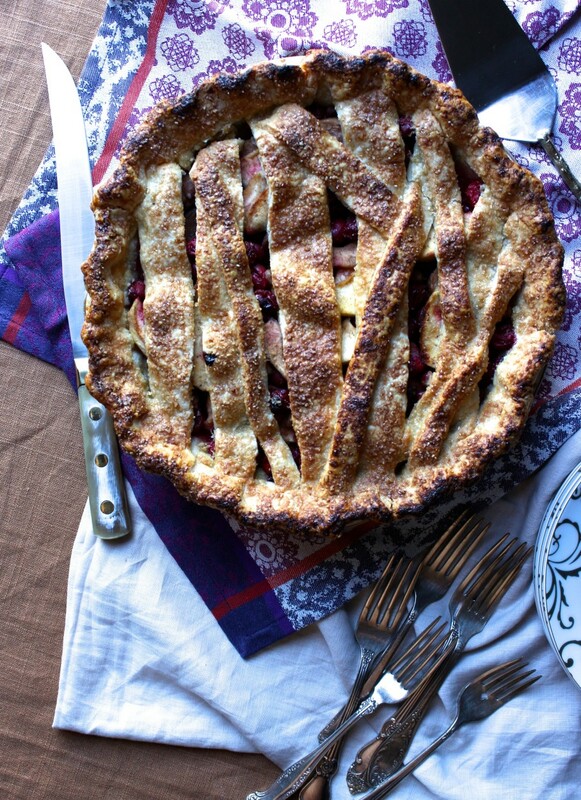 The flaky, buttery crust (yes really!) 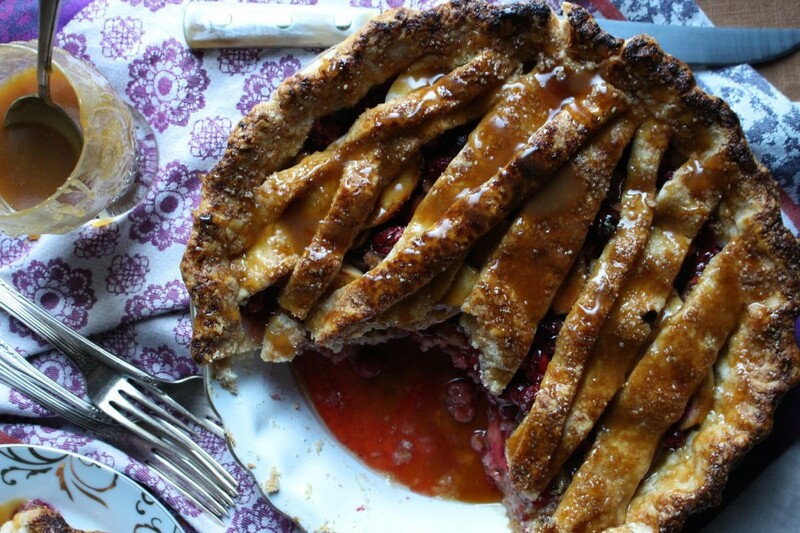 is filled with sweet pears and bright tart cranberries, a perfect union for some very good pie and even better with a good drizzle of rich caramel on top! Preheat oven temperature to 375 degrees F (190 C) with a baking sheet set on the lower third part of the oven. Prepare two pie crusts per instructions on my apple pie recipe post, use one to line a pie dish, the second to roll out a flat sheet ¼-1/8 inch thick almost the size of the parchment paper (step by step can be found on apple pie or pumpkin pie post). Transfer to a baking sheet to give support. Refrigerate both. Meanwhile prepare caramel, combine 1 cup of cane sugar and the water in a medium saucepan and cook over medium heat until sugar has dissolved. Do not stir during this process. Add non-dairy buttery spread and bring to a boil. Continue to cook over medium heat until mixture turns a reddish-golden brown color and it covered with bubbles. Note: swirl the saucepan to see the color of the mixture under all the bubbles. Remove from heat and immediately but slowly add the coconut creamer (be careful, the mixture will violently boil) and quickly whisk mixture well. 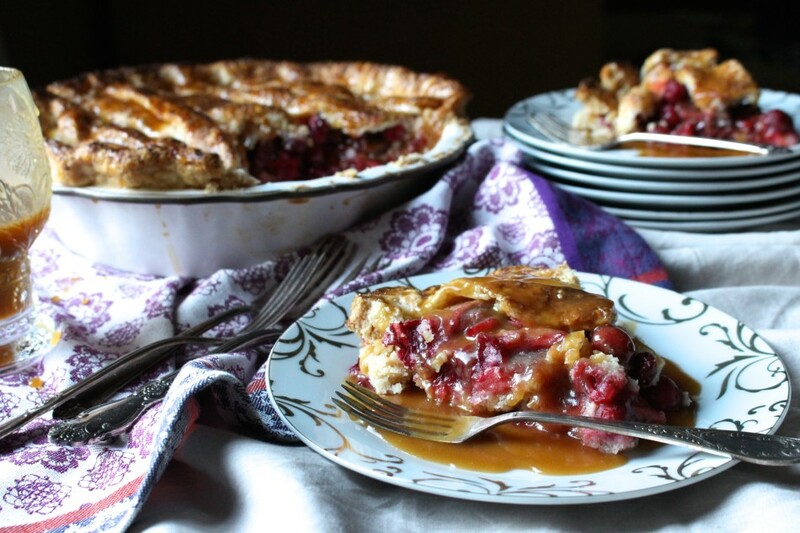 It will appear dark brown and thin (it will thicken while chilling), set aside in the refrigerator while you prepare the cranberry pear filling and finish pie crust. Take out pie crust shell and flat dough sheet from refrigerator, then line pie shell with parchment paper and pie weights. Par bake for 10 minutes. Meanwhile, pour lemon juice into a large bowl, add cranberries. then peel, core and slice (1/4-1/2 inch thick) pears. Add to lemon juice. Sprinkle 3 tablespoons cane sugar over pears, toss to combine and set aside to soften and release some of the juices, 30 minutes. Note: Skipping this step will make the pie too wet. While waiting for pears to release liquids, prepare top crust. Using top half of the flattened dough, cut out lengthwise ½ inch wide strips and 1-inch wide strips. Set aside. Meanwhile, in a small bowl, sprinkle the Angostura bitters over ½ cup of sugar. Add cinnamon, allspice, nutmeg, black pepper, kosher salt, and potato starch, mix well. Add prepared cranberries and pears to the sugar-spice mixture, without the remaining juices. Gently toss pears, leaving the remaining liquid behind, to fully coat and evenly distribute the sugar-spice mixture. Add fruit to par-baked crust as tightly as possible, with minimal gaps. Then carefully lift up prepared strips using a long icing spatula or a sheet of paper (it also works well) and place over fruit filled pie. The center of the pie will take the longest strips and shorter ones toward edges. Making sure each (strip) end touches crust edge, then gently pinch into the crust. When done, prepare logs to become the crimped edge on the crust. Grab half of handful worth of dough and roll out four one to half-inch sized logs, about 5 inches long, then place each on top of pie edge and gently pinch dough (moving downwards) to blend and seal on pie shell and over edges of lattice strips. Then crimp edge. If dough feels stiff wait 5-10 minutes until pliable. Chill the pie in the refrigerator for 10 minutes. Liberally brush crust with “egg” wash then generously sprinkle raw sugar all over. Place onto pre-heated baking sheet (careful!) and bake for 50-55 minutes, rotating the pie midway, until deep golden brown and juices are bubbling. Test the pears with a skewer or toothpick, they should be tender with a slight bit of resistance. Note: Par-baking the crust will allow you to make the pie a day or two before serving. I have made this two days prior to serving, keeping it in the refrigerator, and the crust was not soggy on the bottom. The pie will keep refrigerated for three days or two days at room temperature, lightly covered. 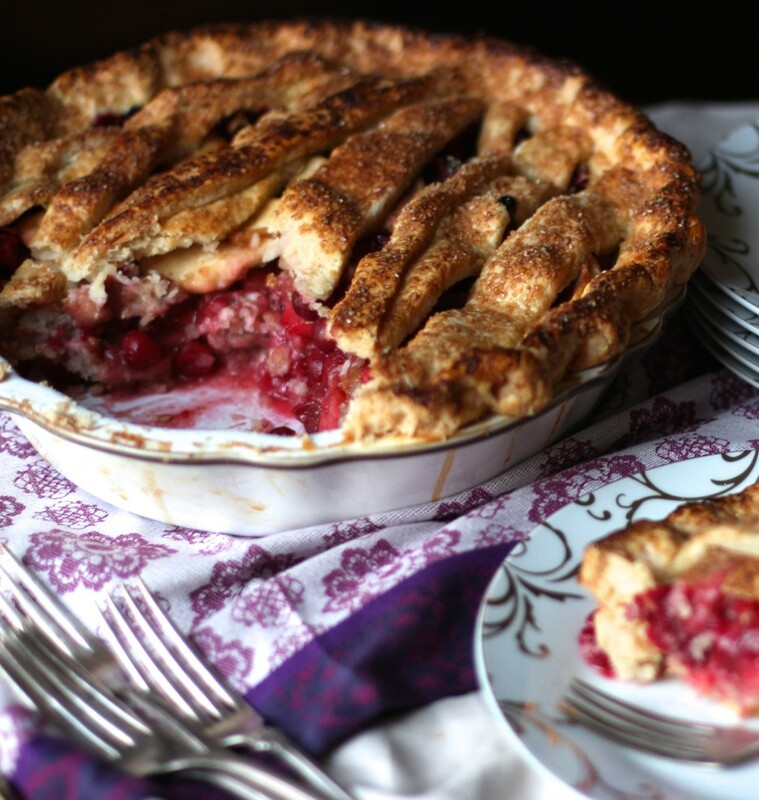 Making a pie from start to finish takes time, no matter what your skill level is. You will need to allow 4-5 hours from crust making to eating (this includes 2 hours of cooling before cutting). Baking times can range depending on the type of pie dish. 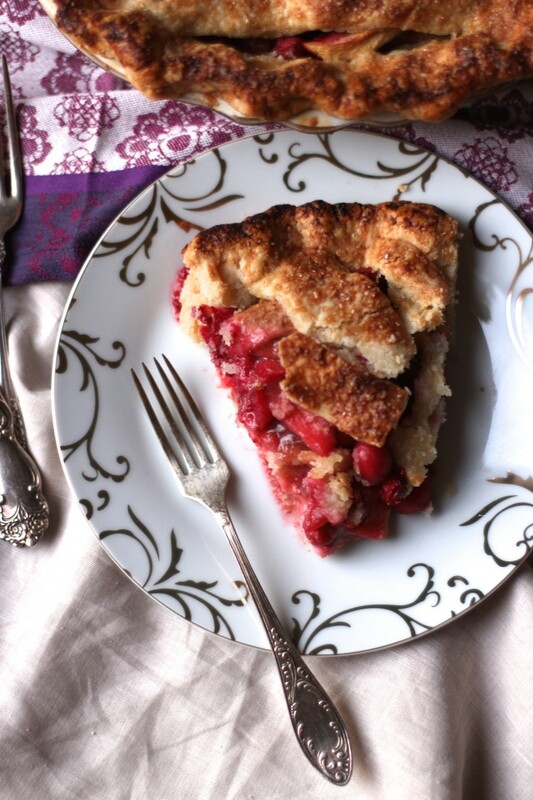 Temperature given for this pie is based on ceramic pie dish. A metal pan conducts more heat, lower by 25 degrees F and add 5-10 more minutes of baking time (keep an eye on it to judge) may be needed, whereas a glass pan can be baked at 400 degrees F with the same baking time. I found this recipe needs a par-baked crust since the dough along the sides and bottom tasted somewhat raw. With that, the authors do use standard gluten flours for their pies, which as you know can make a big difference as with this pie. Lining the pre-baked pie and filling with weights prevents puckering and air pockets in the dough. Gently remove to prevent pulling the par-baked dough. 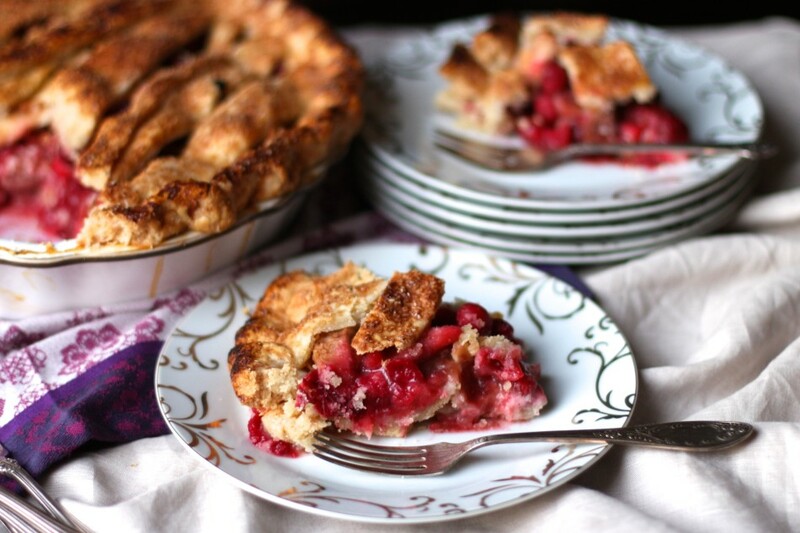 After having your apple pie last year I can only imagine what this cranberry pear pie must taste like! I love cranberry and definitely giving this a try! 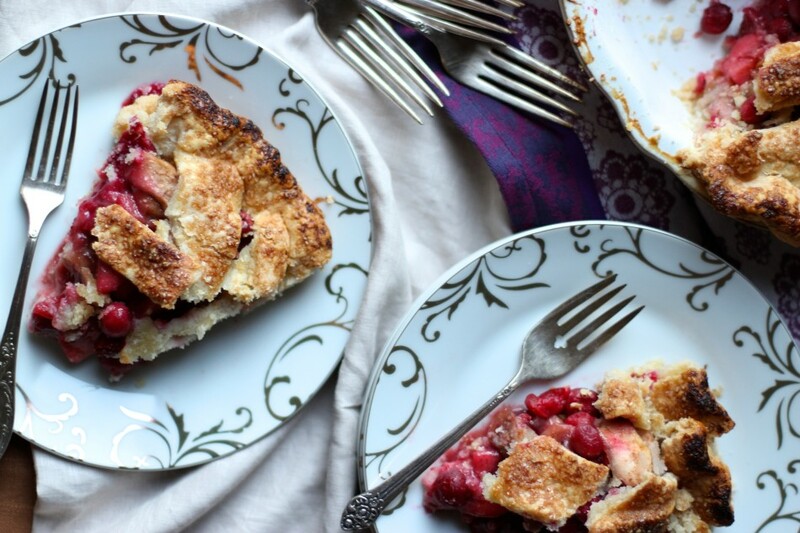 Thank you for sharing your egg free pie recipes. Thanks Heather, glad you enjoyed it! Hope you love it as much as we do...enjoy! This looks beautiful Jessica. I've made your apple cupcakes with caramel topping which was thicker than the caramel shown here. Is this different? Also, can I make the caramel today to serve on Thanksgiving and refrigerate the pie shell until Thursday? Yes, the caramel on the cupcakes is thicker and stickier to hold on to the cupcake (less fat) whereas this one is more for drizzling and needs more fat. The caramel will stay fresh up to two weeks. It would be better to freeze the crust until Wednesday if you plan on baking on Thursday. If you are planning to make it two days ahead, then yes it's fine to keep it in the fridge for a few days. Hope that helps...enjoy! I get looks all the time when I say it's gluten free and vegan! These photos have me wanting to set aside time tomorrow to make this! I don't even like pears and I want this! Beautiful pie! I'm not much of a decorating pie person, do you think I can top with a crumble and bake same amount of time? Crumble works well too, same baking time but be sure to watch the clock at the 45-minute mark, depending on your fat/flour ratio it can burn the top. If looking for a crumble, try my banana cake with streusel crumble...enjoy! I haven't frozen the fruit mixture before so I'm not sure, but I wouldn't try it when serving guests just in case it mushes up. You can, however, make the fruit filling the day before and certainly freeze the crust until Christmas (freezer wrapped well). Let me know how you like the pumpkin...enjoy! Your apple pie bakes at 350 F and much longer. 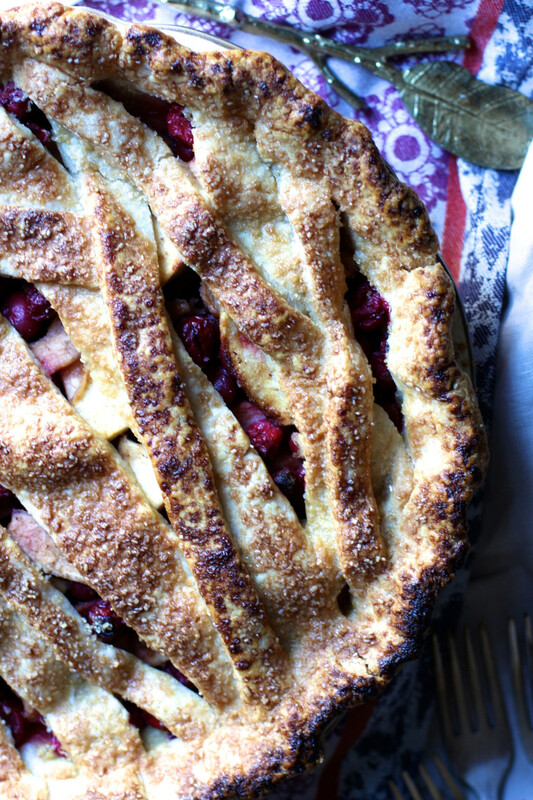 Any reason this pie is at a higher temperature and shorter baking time? Thanks! 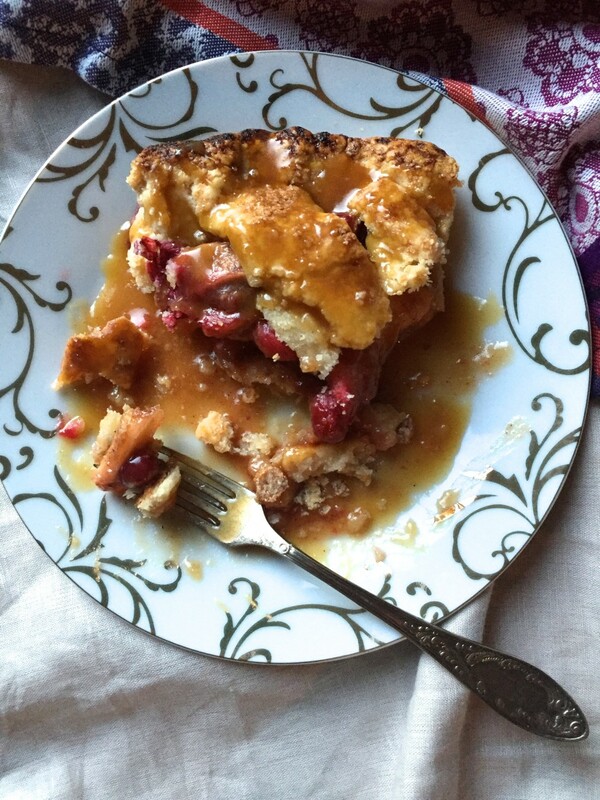 My apple pie was inspired by the Williams-Sonoma cookbook. The apple pie is just as good, but a little different, less browning on the dough, and more baking time. Baking the pie at a higher temperature requires shorter baking time and will caramelize the crust more. I can't really say the two pies taste that different, in terms of texture and crust, other than this pie has some crispier edges and the apple pie is flakier. Hope that helps! Pie oh pie. How beautiful! This is definitely going to be on my Thanksgiving table. Thanks for the recipe. Thanks Jessie! Hope you love it as much as we do! Enjoy! I don't think so, it will make a more juicy filling. Do make sure to remove all the liquid and add 1 extra tablespoon of starch to absorb any additional juice. Enjoy!! I managed most of the lattice design and it smells and looks amazing! I did grab a spoon of the filling before baking omg!! Can't wait to serve this to my family and cheeseclothing my turkey!! It makes the house smell all holidayish, love that! That filling raw is delicious, but wait until you try it in the pie...it's goodness I tell ya...enjoy!! This looks wonderful! 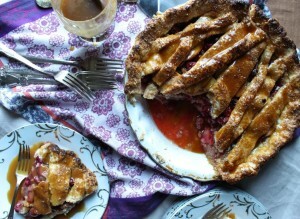 I want to make the crust this week to freeze then make the pie the day before Thanksgiving. Would that affect the final result? Thanks!